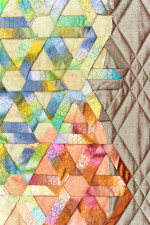 The goals for the quilt were to honor the past while looking to the future of both the county and the state. A tour of the new Development Services Building for Clackamas County showed sustainability as the driving force in the building’s design and use. The building contains green building elements and earned the LEED silver certification. The county had also moved to a 4-day workweek in an effort to improve staff efficiency and reduce gas emissions. After researching symbols for sustainability I chose the universal symbol for recycling, which is a mobius trefoil whose three sides represent community, environment, and economy: the key areas for the county workforce. 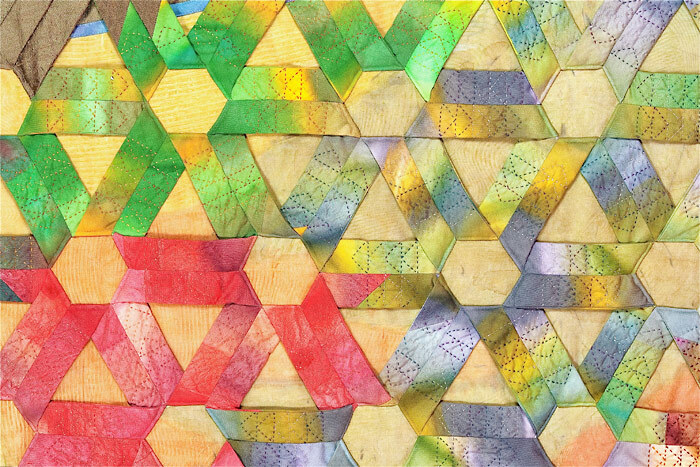 I created three-dimensional motifs based upon the trefoil to represent the county goals toward sustainability. To show the circular interaction of community, environment, and economy, I replaced the symbol’s three chasing arrows with the flying geese pattern, a traditional quilt pattern, and one honoring the past. 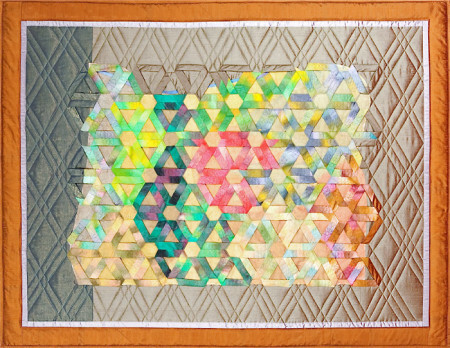 The quilt’s color scheme is based upon an exhibit at the Oregon Historical Society called “Oregon, My Oregon.” The exhibit is further based upon a book entitled Oregon’s Living Landscape completed by the Oregon Biodiversity Project. The exhibit and book identify ten eco-regions within the state. The trefoil motifs and background of the state are dyed to reflect aspects within those regions. The ten eco-regions are: Coast Range, Willamette Valley, Klamath Mountains, West Cascades, East Cascades, Columbia Basin, Lava Plains, Basin and Range, Blue Mountains, and Owyhee Uplands. The inner border is asymmetrical with three green borders representing Washington, Idaho, and California and a blue border for the Pacific Ocean, recognizing the important role water plays in our state. 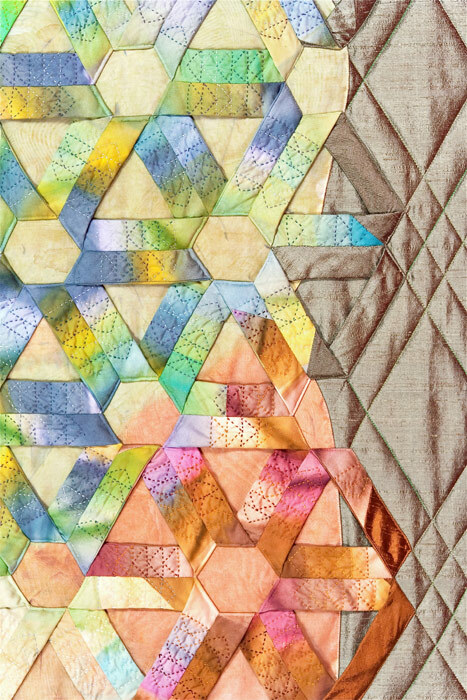 The outer borders are silk, which give a sheen to the quilt and reflects the metallic nature of the staircase where the quilt hangs. It is both abstract and representational, with it’s innovative nature reflecting that of the building where it is on display. 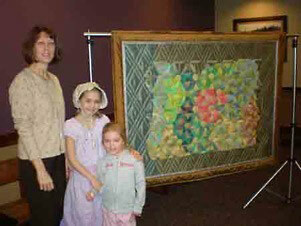 The little girl representing early Oregon settlers, her little sister, and me pose next to the quilt.